Could the Condo Termination Act affect you? Owners of units in a Chandler condominium complex are appealing to state legislators to make major changes to a law that can force Arizonans to sell their homes to investors. The Condominium Termination Law says that if 80 percent of condo owners agree, the HOA can disband, and the units can be sold. The remaining 20 percent of owners have to sell at a fair market value to be determined by an appraiser chosen by the HOA. In this case, the HOA is run by the investors. In 2018 the law was used by a real investment group to take over the HOA for Crystal Cove Condominiums, begin converting the complex to apartments and rename the property Soleil at Anderson Springs Apartments. In October, owners received a letter telling them the sale was expected to close on December 16, and an appraisal was done for their units. Owners let me know they believed their homes were significantly undervalued, and they say the HOA's appraiser had not set foot in their homes. A 2018 change in the law gave homeowners five percent in moving costs and the right to their own appraisal. Disputes would be handled in arbitration. 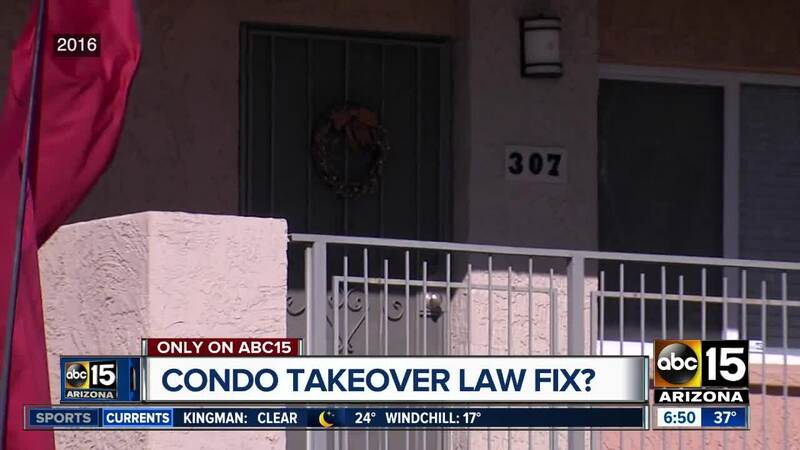 The condo owners we spoke with say there are still majors problems with the law. Until recently, these owners say they could not come to an agreement with the investor about who the arbiter should be, dragging the process on for months. State Representative Jeff Weninger (R-Chandler) met with several homeowners at the Capitol on Tuesday to discuss possible fixes. "This is essentially, in my opinion, private eminent domain. People are forcing people to sell their homes," Weninger says. He says the changes made improved the law but, "I don't think we had enough stakeholders involved who were actually going through this process to help us find the solutions that can better protect them." For nearly two hours, the group hashed out questions they'd like an amendment to the law to answer. Questions about whether the investor can use units they purchased in the appraisal? How to verify that the investor actually has 80 percent? How do they know an arbiter does not have conflicts of interest? Weninger says he thinks some of the changes have a good chance of becoming a law. "I'm highly confident we can put in some good changes and we can get this bill through," he says. But there is also a good chance it won't be passed in time to help the folks who are fighting for it.